Now what does Lil Bits "Nitwit Thicket" have to offer?? Well, you may want to have a good look as these premade digital elements are here to give you more, easy to use options for the elements in your scrapbooking layouts and cards. 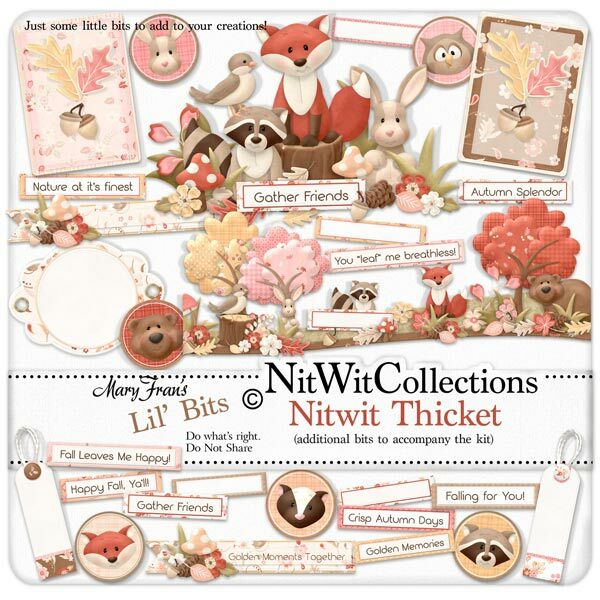 These digital elements are NOT included in the FQB "Nitwit Thicket" Collection so don't pass these by! 1 Cluster of the Nitwit Thicket friends! 2 Topper strips - don't miss using these beauties! 6 Wordstrips blank, in case you need to say it yourself! !